Sushi rice in under 5 minutes? 1. Take the rice packet from the package, peel open the marked corner to the line (they have it marked), and place it in the microwave for about two minutes. 2. Once your rice is ready, open the sweetened dehydrated vinegar package and sprinkle the powder evenly over the rice. Mix the powder in similar to how you would mix in the vinegar for your homemade sushi rice with a rice paddle or spatula. And that’s it. All done. What’s more is the rice is surprisingly good. All in under five minutes. Maybe this is not something to eat everyday, as ultimately, I do believe that whole, homemade foods are always better for us, but this instant rice is a good option once in a while if you’re on the run. I acquired an early love and appreciation for sushi from my father when I was growing up. At the heart of sushi making, the most important aspect of it is the rice. Luckily, if you know how to make steamed rice, sushi rice is very simple and easy to make. 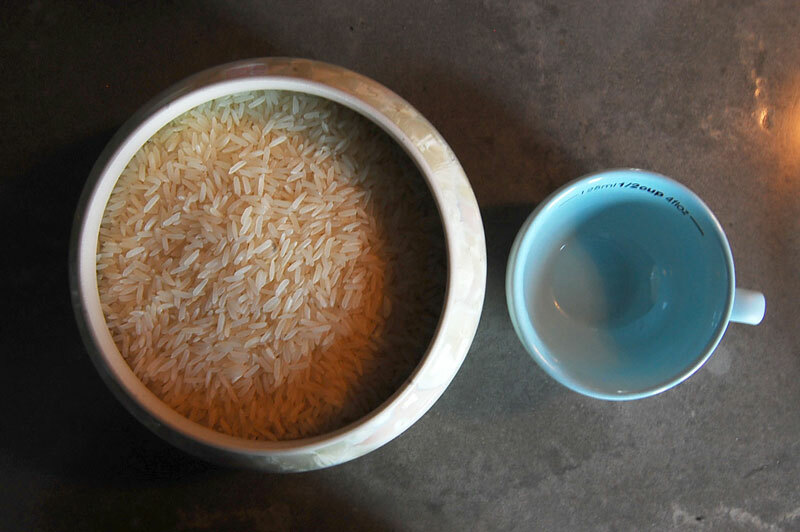 The trick is to use a little less water, so it’s less moist, and to mix the sweetened vinegar mixture into the rice as soon as the rice is cooked and is still hot. (More on this below.) The recipe I use is the same one that my father used whenever he would make sushi for us. Do note that the yield is quite a lot, so if you’re preparing sushi for fewer people, you can use the second ingredients list. Making a nice, creamy risotto had evaded me for years. My downfall in the past was my split attention span (I like to call it multi-tasking) and the assumption that making risotto is similar to making rice or congee: add water and boil. The reality couldn’t be farther from the truth and to think all it took as a little investigation into “how to make risotto”. So, to save you from the same sad fate as my past attempted risotto creations, this is how you really make risotto and it’s surprisingly easy. As an aside, risotto is not something to make if you need to be multi-tasking, as timing is of the essence. It’s not hard, you just need to be able to pay attention to it and have a little patience. The whole process takes less than 30 minutes. In a medium to large saucepan, heat up the butter, 1/4 cup of the cream, and olive oil (just olive oil if vegan) on medium heat. When the butter has melted, add the chopped onion (and garlic, if you’re using garlic). Simmer until the onions are translucent and nearly breaking down. In a large pot, pour your stock and wine. Simmer on low heat without a lid. It should not come to a boil. Back to your onion saucepan – add the rice and stir, still on medium heat. The edges of the rice should also turn translucent, while the centre will remain opaque. Stir the rice to keep it from burning. Lightly toasted is what we want but not burned. When the rice is translucent, ladle in a cup of broth and stir it into the rice. Keep slowly stirring. The rice will absorb the broth at which time you can ladle in another cup of broth. You will be ladling in a cup of broth at a time – only a cup at a time. This is where that patience and attention comes in. It’s important that you only do a cup at a time and wait until nearly all of the liquid is soaked into the rice before you add another. No need to rush. Too much liquid and your risotto could get really soupy rather than creamy and overcook. When your risotto is nearing completion – you’ll be able to tell as the kernels are nearly al dente and the consistency will be creamy (you’ll also only have about a cup or two left of your broth) – add the chopped mushrooms and spinach. Continue stirring. Finish adding enough broth to get your risotto to the perfect consistency and the rice just cooked. I encourage taste testing to make sure. Note that you may not need all the broth – or if you run out, use a little water or more stock. Add the grated parmesan cheese and the last 1/4 cup cream to the risotto, stir to have it melt in (ignore this last step if you’re vegan). You’re ready to serve! Risotto is best served right away – buon appetito! This post is dedicated to my friend, Lola. I will make congee regularly around the year, but never at a higher frequency than when I’m sick. This week was no exception. Having picked up an ugly virus, I gathered up the pot, rice, and chicken broth for my congee. That is the beauty of congee. That’s all you need. My basic recipe will make a large pot of plain congee that will last one person about two or even three days, which is great when you’re sick and don’t want to be cooking multiple meals.